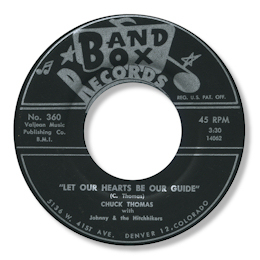 There are only a couple of releases by Chuck Thomas that I know – and both are strong southern style soul, despite the fact that Band Box were located in Denver, CO and the majority of their output was pop/country. Nevertheless Let Our Hearts Be Our Guide is very strong deep soul, great rap and a lovely “little label” arrangement and girl chorus. Thomas has some nice gospel touches in his committed vocal. I also like the waltz What Can I Do which features some fine horns and another class vocal.